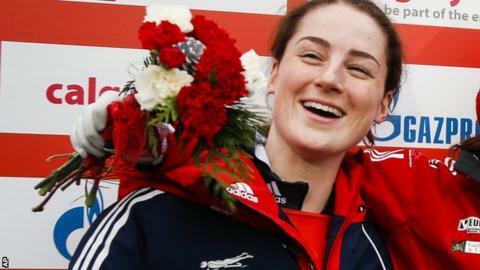 Great Britain's Laura Deas has won silver in the World Cup skeleton after two outstanding runs in Calgary. The 25-year-old completed the course in a combined time of one minute 55.62 seconds (57.91 & 57.71) in what was only her second World Cup outing. The Wrexham-based slider finished behind Canada's Elisabeth Vathje but ahead of Germany's Tina Hermann. Olympic skeleton champion Lizzy Yarnold missed the race due to dizzy spells after winning in Lake Placid last week. "I am absolutely delighted to get my first World Cup medal, particularly on a track which was new to me," said Deas. "Hopefully I can continue to perform this well after the Christmas break." Fellow Briton Rose McGrandle, 27, finished sixth in an overall time of 1:55.98.